Discussion in 'Outerwear' started by VestCoast, Jun 19, 2018. I am new to the Fedora Lounge but have been combing through threads for a couple of months now and have finally decided to surface. I just graduated from college in New England and am now employed in Austin Texas as a geologist. 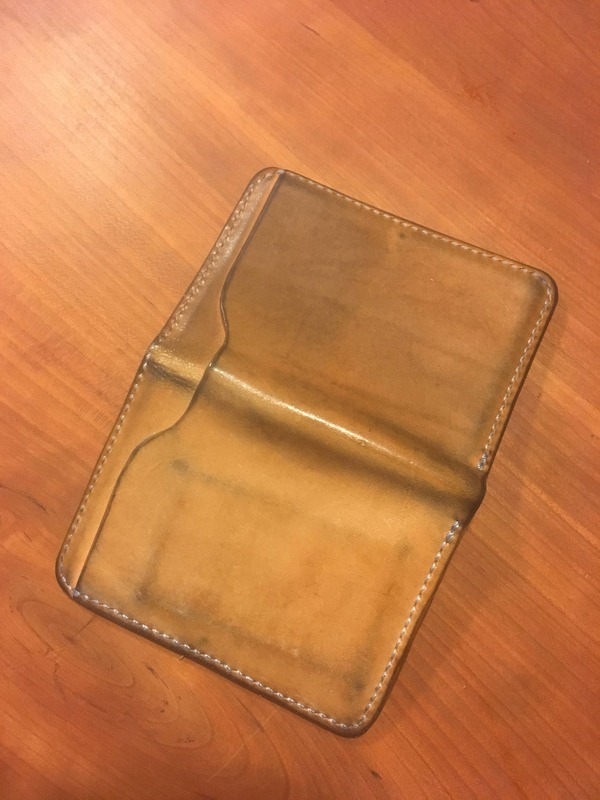 I have a longstanding interest in bench-top crafting, I do hobby-level leatherworking and have recently purchased a cylinder bed industrial sewing machine and am learning to make some clothes and leather goods. 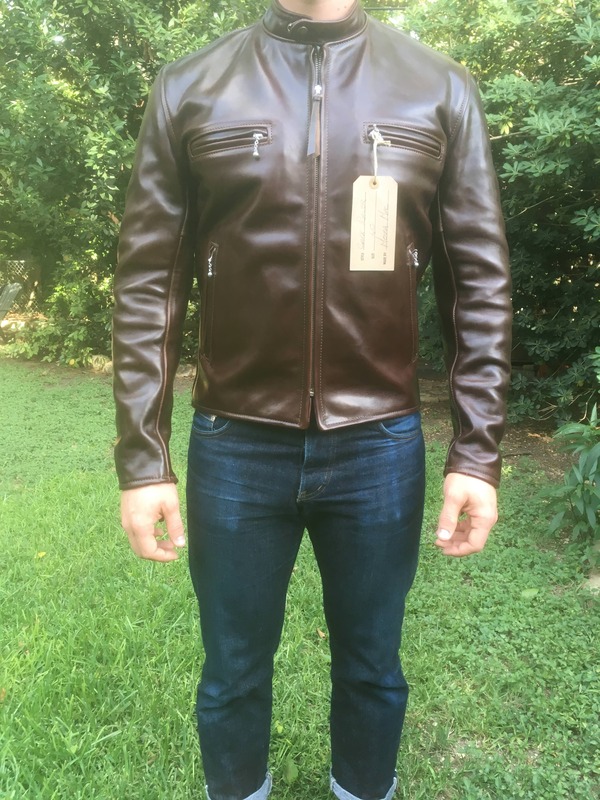 It’s a lot of fun and I love to work with leather which is why I am coming to you all today for advice on ordering an Aero Leather jacket. I played rugby in school but after having a brain surgery and radiation my tacking days are over so I haunt the weight room now instead of the pitch. I have a rugby influenced physique but post recovery have now thinned out to a maintenance weight of ~185 so I am looking for a jacket that fits me pretty well at my current shape/weight. 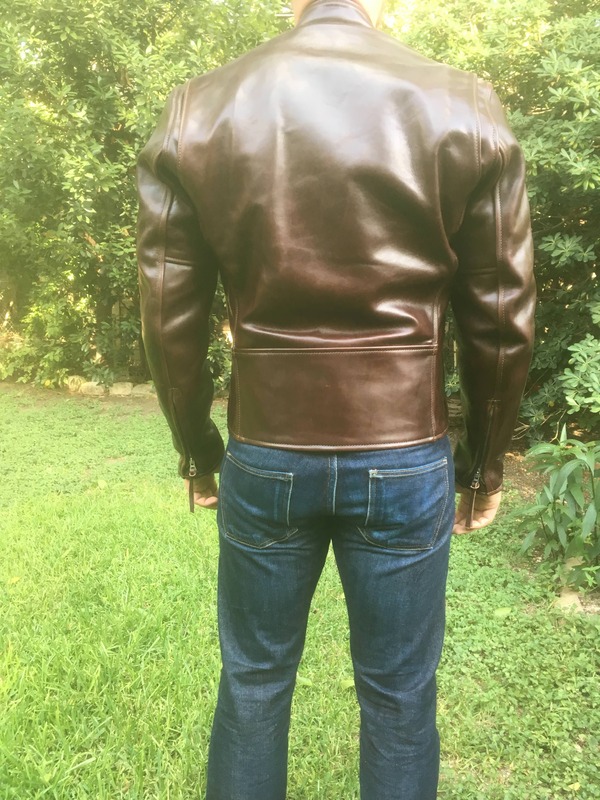 I have included the photos I took with the fit jacket on and was hoping for some feedback on how it sits. I took two full sets of photos in two different outdoor lighting. I should mention that I do not ride and plan on wearing this jacket exclusively in a casual and work setting (Geology as a profession leaves a lot of interpretive room in the dress code). Sorry to spew out my numerous questions and uncertainties, but any advice would be greatly appreciated. Thanks for both your feedback and for all of the accumulated knowledge here I have already sorted through! Fanch, navetsea, El Marro and 3 others like this. 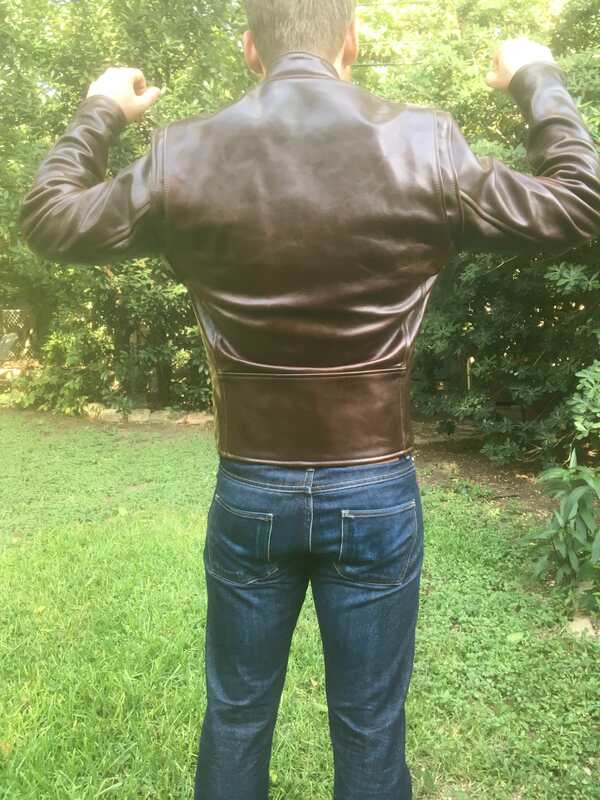 You won't get more range of motion from an Aero jacket, if you are a fan of superior range of motion in a leather jacket, I would go with a purpose-built jacket such as a Vanson, a Johnson Leather or a Langlitz. For an Aero, this is as good as it gets. Other than that, fit looks good. I like black over cordovan but this is a purely subjective thing of individual taste. However, for a first jacket, I'd go with a classic color, black or brown. For a moto-inspired style as the Sheene, black. Ages the best too, imho. Ask for deeper pockets on the chest pockets or these will be incredibly useless. I would go with no zippers on the handwarmer pockets. It's really uncomfortable to put your hands into these when they have ziips. Also, zip scratches the leather of your sleeves and potentially your watch. With two inside pockets and chest pockets you have enough space to securely carry your stuff. I would go without the shoulder gussets. Look up some old jackets, I don't like how those age and hang out eventually. The increase of range of motion is very little, too. Hope that helps! 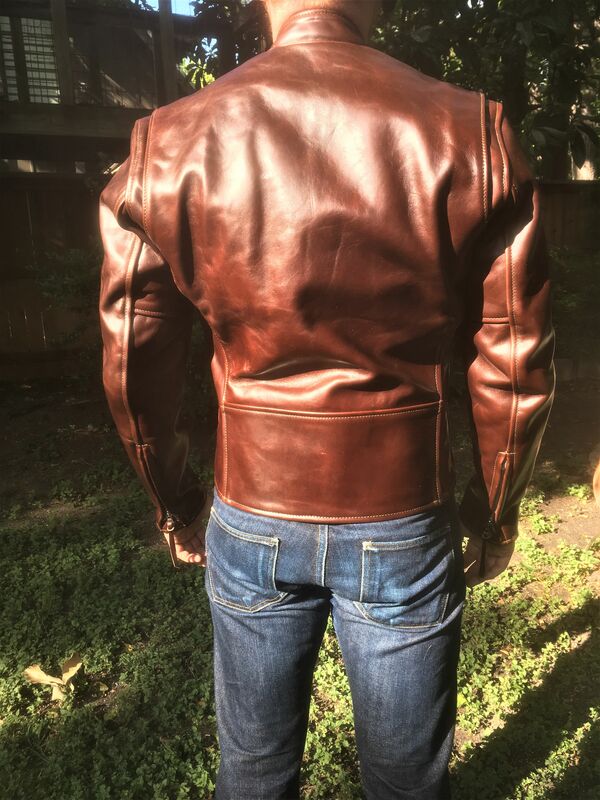 Most of this is purely subjective, for example many folks here love the look of shoulder gussets, so always keep in mind with any advice you get, it's mostly a matter of taste and you should get what you think suits you best. Fanch, Benny Holiday, sweetfights and 3 others like this. I'm surprised that you fit a 40 with your measurements. I am nearly the same measurements as you, and my Sheene is a 44. I have two cafe racers from Aero, size 42. All three fit my body, but I definitely have more free movement in the 44 Sheene. It's marginally larger, but it makes a difference. Shoulder gussets or a action back can give you more freedom as well. Great pictures, and the fit looks perfect. I think the Sheene is one of the best-looking Aero jackets. The Café / Sheene is designed as a closer fit, and after the break-in period it will loosen up and feel even better. 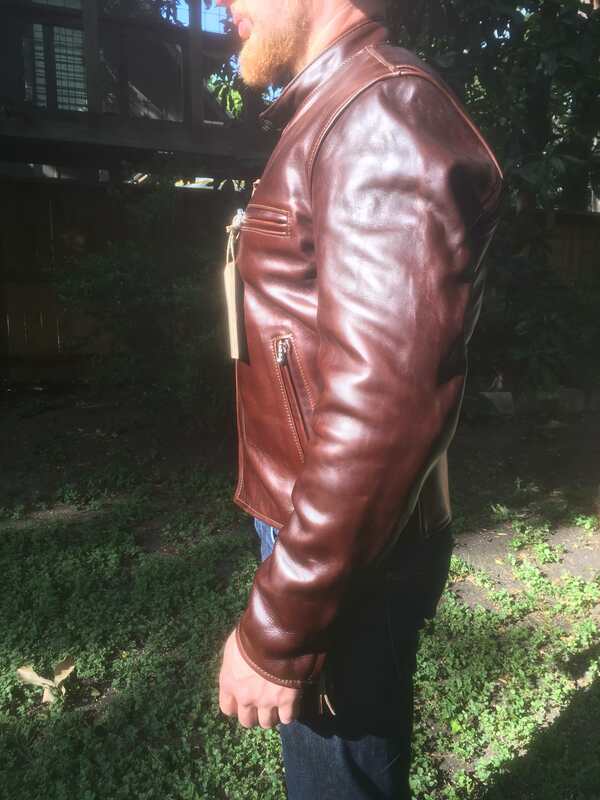 Your leather choice, the CXL FQHH, is just perfect for this jacket style. I have the Café without the shoulder gussets, and the Café with, and I prefer witihout. Just as you mention, they do gather a layer of thick leather behind the arm. I notice this more on one arm, where the leather folds differently because of the gusset seams and seems to press on my back uncomfortably. But it is breaking-in and is getting more comfortable. Any future jacket in this style will be without the shoulder gussets. I would suggest the Sateen lining throughout. The Drill is a rougher texture and will make the jacket harder to put on and take off. And remember, this is a tighter fitting jacket with more limited shoulder movement, so you want as easy an entry and exit as possible. I debated the August collar for my Sheene, but in the end spec’d the Highwayman collar. To me, the Highwayman collar seems to fit the jacket better, but that August collar does have style. But I would NOT have the collar snaps. 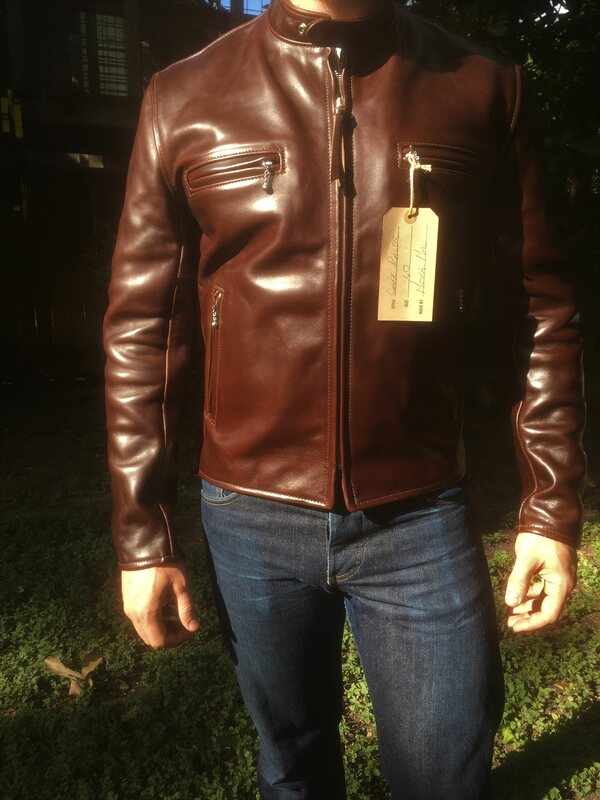 I also have the A-2 jackets, and always leave the collar snaps open / unsnapped to make the collar more comfortable. Then you see the snaps. You’re not going to ride with it, so why even install the snaps? Finally, I agree with jacketjunkie... omit the zips on the hand warmer pockets if you even intend to put your hands there. This IMO is a perfect fit and i would not change anything! 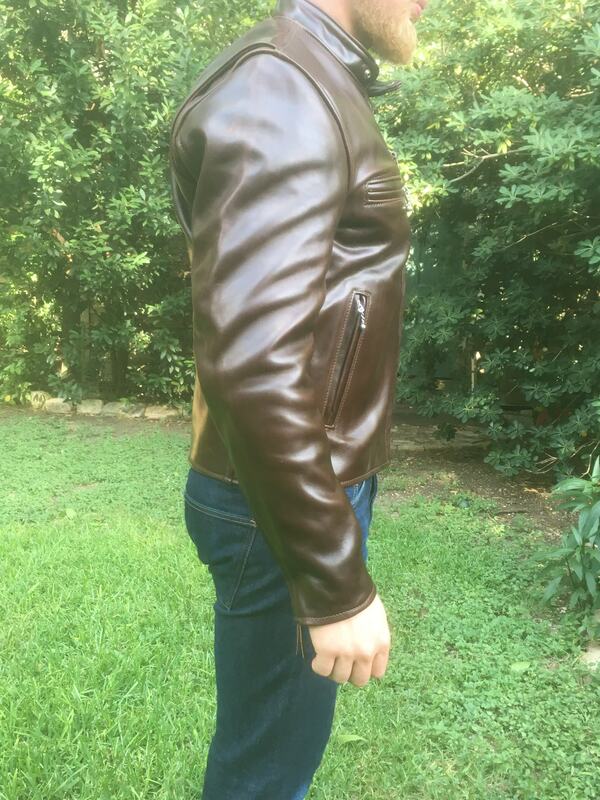 Range of motion is what it is, this is a thick leather jacket, not spandex... Don't forget this is an unworn jacket. They get better with wear. Aero's also have pretty low armholes that don't do anything for forward/upward reach. I have jackets that fit me tighter than my Aero's but still offer much more range of motion. Benny Holiday, sweetfights and AbbaDatDeHat like this. 1. Like others, I'm a tad bit surprised that you're considering a size 40 in a Sheene. I'm at 165/6' and my size 40 Sheene is tight in the shoulders, but still breaking in. And this is with the softer Vicenza. If I was at 185 and ordering FQHH, I'd seriously consider a size 42. I suppose it depends on how tight you want this jacket. 2. Personally, I'm not a big fan of shoulder gussets, especially with the Sheene style. A simple back yoke is a good choice. The back gets a little too busy with gussets, yoke, and kidney panels. 3. I would definitely pick the Sateen over the cotton drill. I found the cotton drill is a bit rough, and the sateen to be quite durable and much softer and more comfortable. 4. I like the functionality of having zippers on the handwarmers- I leave them zipped up and rarely put my hands in the pockets. But I find that the zippers are handy to secure small items. 5. Although in theory, collar snaps seem like a good idea, I've found the reality is that they just an unnecessary addition. 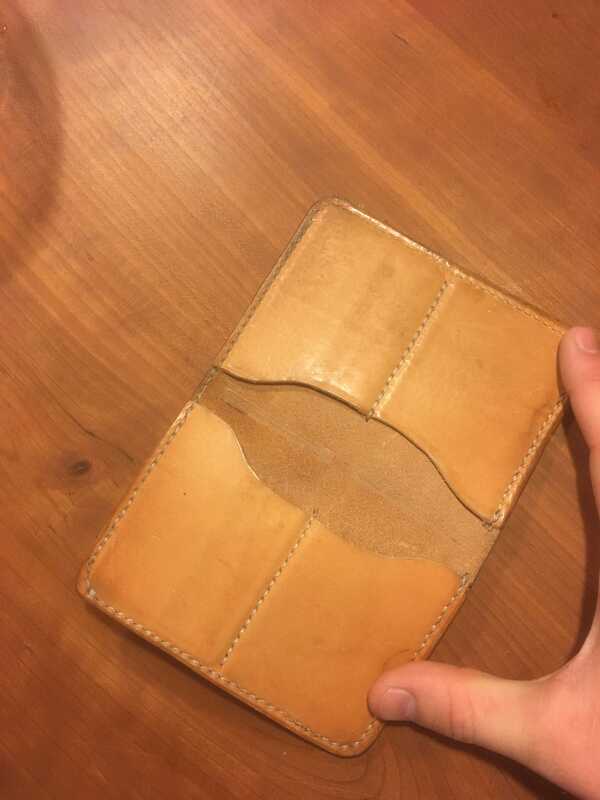 The snap outline shows through the leather, and not in a good way. And they really don't have any function unless you're riding in stiff winds. 6. I'm a big fan of the August collar, and for my taste, it's the best looking choice on a Sheene. Good luck! Fine choice for a first jacket. Look forward to seeing the fit pics. Fanch, ProteinNerd, Peacoat and 2 others like this. Man that would be one tough fit jacket to send back! Fit looks really good. I wouldn't change a thing on how this one is spec'd for fit. As far as the rest goes, it's all fairly minor stuff....I agree with techno about black. My black CXL CR is an everyday staple and one of the very few to escape my buy/sell modus operandi. ProteinNerd, Benny Holiday and sweetfights like this. To me, that fit is perfect. 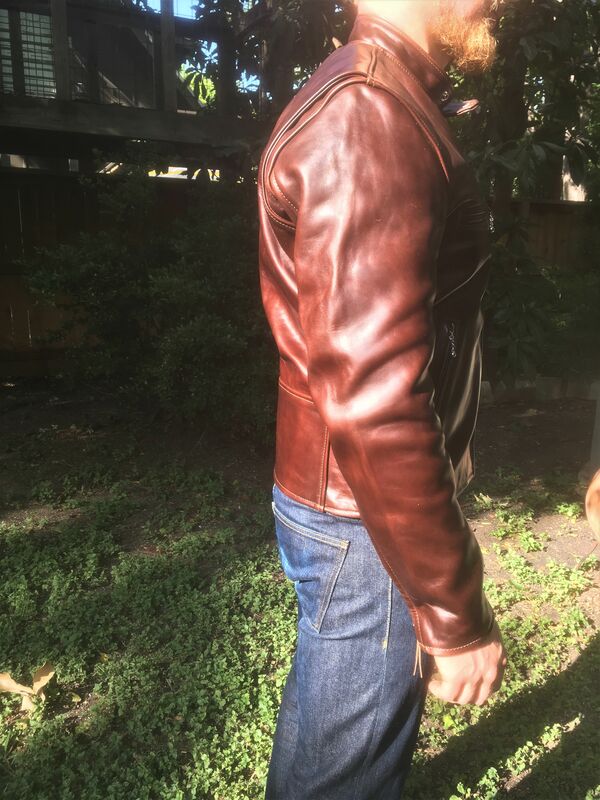 My personal measurements are practically identical to yours and this jacket's measurements are what I look for (depending on style and need I may move an inch on some measurements but those numbers are my template). And they aren't typical size 40 measurements. This jacket looks great man. Home run. Perfect. Worry more about the measurements you desire rather than the listed size. A cafe racer with a 23-inch pit to pit would be considered a size 42 by most. Having said that...that jacket fits you damn well! Peacoat and sweetfights like this. Vestcoast - welcome to FL!! May your wallet survive on here! That may indeed make sense soon. I think what has been shared is spot-on, and in a Sheene I am between the 42 and 44 sizes. My favorite Aero's have the Cotton Drill lining, however I have not tried sateen so really connot comment there. Perhaps the biggest "liability" you face is your physical location...Austin Texas. That will seriously limit your wearing time with any leather jacket. I know Fanch and perhaps some others may live closer there, however with all the heat & humidity down there, it's hard to imagine more than 3-4 months of good wearing time down there. Good luck with your search, I really appreciate your artisan nature and wanting to learn these sorts of "old world" crafts and appreciate real craftsmanship. This is how a Sheene fits. The perceived lack of shoulder freedom is simply a result of design. We are almost identical in dimensions and size. I have a 40 Aero Cafe Racer in midnight blue. I had another Aero Cafe Racer that helped me to fine tune what I wanted. I do prefer and have the shoulder gussets. The only difference from your photos is that you have some more room in your back than I do- as a result of this observation I would say omit the shoulder gussets. No zippers on the hand warmers especially as a casual jacket- You will thank me. I ride a motorcycle and still did not get the hand warmer zippers- not a single regret. The zippers will bite your skin. Go with sateen. Much easier to slide the jacket on and off. You and your shoulders will thank me later. Black or brown CXL for your first and perhaps only jacket. I omit the internal and external kidney panels. Makes for a smoother streamlined finish. I agree, GET the deeper front pockets. I did and my iPhone Plus thanked me. Consider sleeve zippers and whether or not you like them on top or bottom. Get them on top if you like holding hands with the woman in your life. 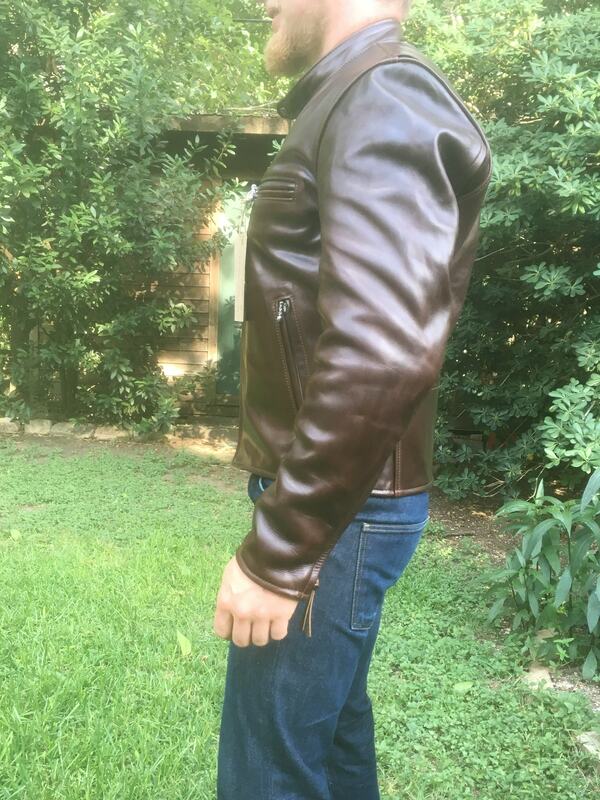 CXL is great leather, since you live in Texas ask for the thinner/lighter CXL of the batch your jacket will come from. Give some thought to the back yoke design that pleases you. Get an deeper interior pocket, consider no closure. 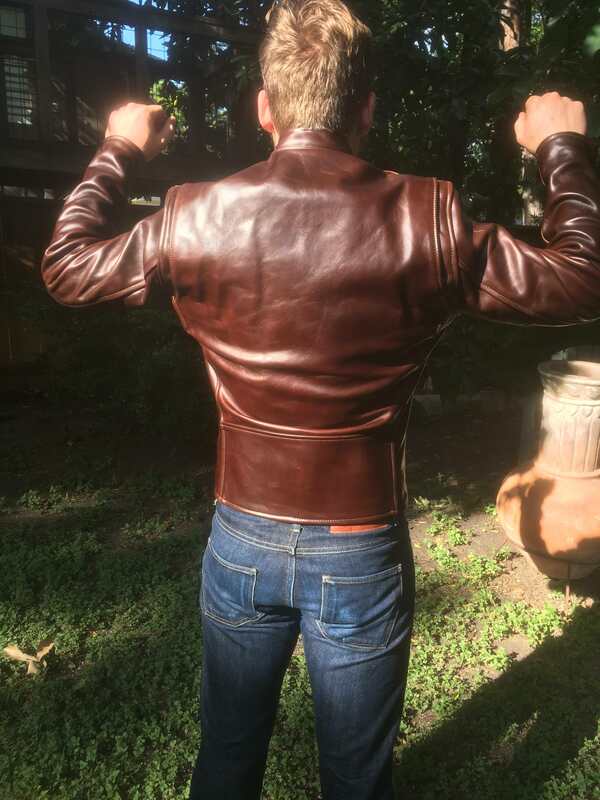 The great advice from this thread truly represents fantastic ideas that cost us all a lot of cash in buying and selling to get that perfect jacket. Fanch, JMax, jacketjunkie and 3 others like this. Man the deeper chest pocket is essential!!! Great point sweet! The front looks great as do the sleeves, but the back is a mess IMHO. I wouldn't be happy with that. sweetfights, Fanch, Alexlutov and 1 other person like this. I have 2 Sheene's currently & sold on a third to another member of the Lounge. Skip the zips in the pockets - they're bloody uncomfortable if you ever intend on using them as handwarmers. Double and triple check your measurements, give these to Carrie & TRUST in her advice. Rarely do any of us actually do this however, instead bombarding her with limitless and pesky questions that ultimately do nothing for the final outcome (which interestingly is almost always what she recommended in the first place...). ProteinNerd and El Marro like this. I agree that the back looks off, the material in the gussets and shoulders seems to gather behind my arms. I think I will omit the shoulder gussets from the jacket in order to tame the back. I also plan on adding in a V yoke which I hope will give the back a little more visual direction. I was pretty convinced that I liked the look of the kidney panel, but creates a fold in the lower back that makes the shoulders/upper back look even more jutting and formless. There seems to be a lot of surprise that I'm fitting into the 40, which is funny because when I was first looking into the Sheene I was looking for a 38 because the published measurements were generally more in line with other (admittedly non-leather) jackets that I own. Carrie convinced me to try on the 40 and its very clear now that a 38 would be way too tight. I have always found my weight to contradict recommended sizing, as I carry what feels like the majority of my body in my thighs. It makes finding properly fitting jeans difficult as many of the popular slim straight cuts cuts make the legs of my jeans look like those pythons that swallow water buffalo. Luckily the raw denim scene is almost entirely internet based so the measurements for every cut are well delineated. After wearing the fit jacket again this evening I am enjoying the fit a lot more, but find that the shoulder gussets really do need to go. I think I will stay at a size 40, I'm worried that if I size up to a 42 the shoulders will be too broad which will in turn make the back look funky. Thanks for all your advice! I want to be able to wear this jacket as often as possible so I think I'll go with the classic black CXL FQHH, which be a pretty versatile color choice. I personally like a red interior with black leather so I think ill line it with the red or wine sateen. Going zipless on the handwarmers makes me worry that the openings will spread open, especially after using them for a while. The jacket has a nice clean look when the handwarmers are zipped closed that I think might be compromised if the zipper is removed, but if having a zipper makes the handwarmers uncomfortable for hands.....a real conundrum. I'm gonna wear this jacket a little more before I send it back in the morning, thank you all for your advice so far! El Marro and technovox like this. Thanks for the welcome! I don't really love the climate here and plan to move somewhere cooler long term, but I want to start breaking in a jacket as soon as I can. Austin is a great city but its gets pretty uncomfortable here no matter what you're wearing. Speaking of wallets, I'll post the first wallet I made that I felt was decent enough to carry around. 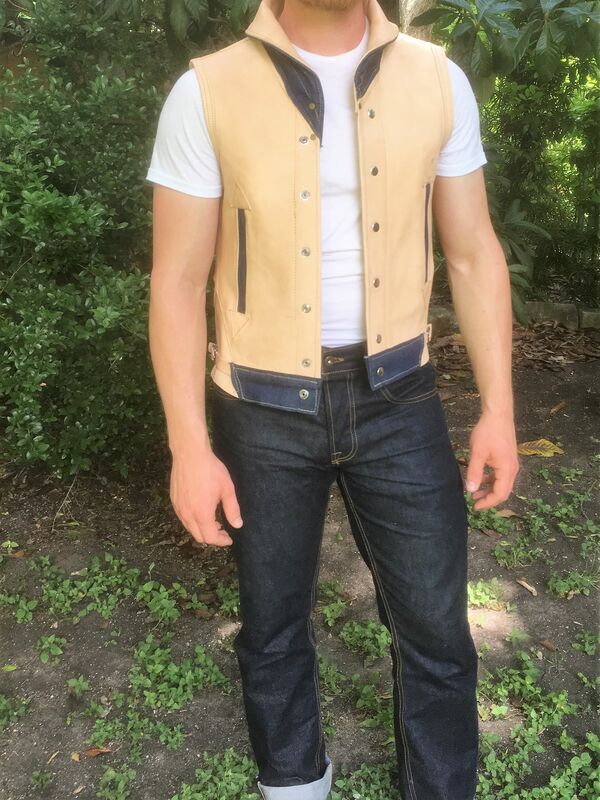 I also made a vest from some milled cowhide to practice some different construction elements--the end result is a little odd to be sure. I had a lot of fun working on the vest (and subsequent username inspiration) but its my first attempt at any sort of garment so it has some definite flaws, particularly in comparison with the Aero I just handled. But hey, that means only progress ahead! Alexlutov, torfjord, JMax and 3 others like this. Hey I see you just replied! 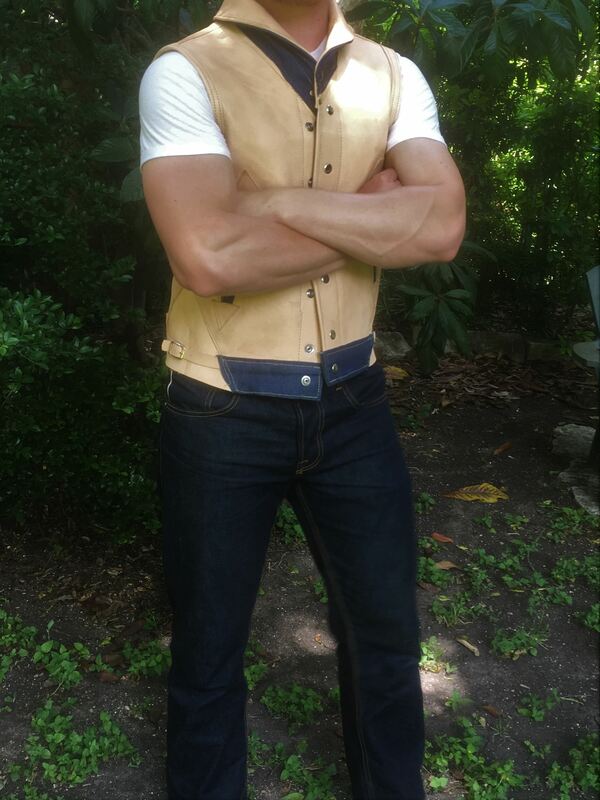 Awesome work on both the wallet and the vest! 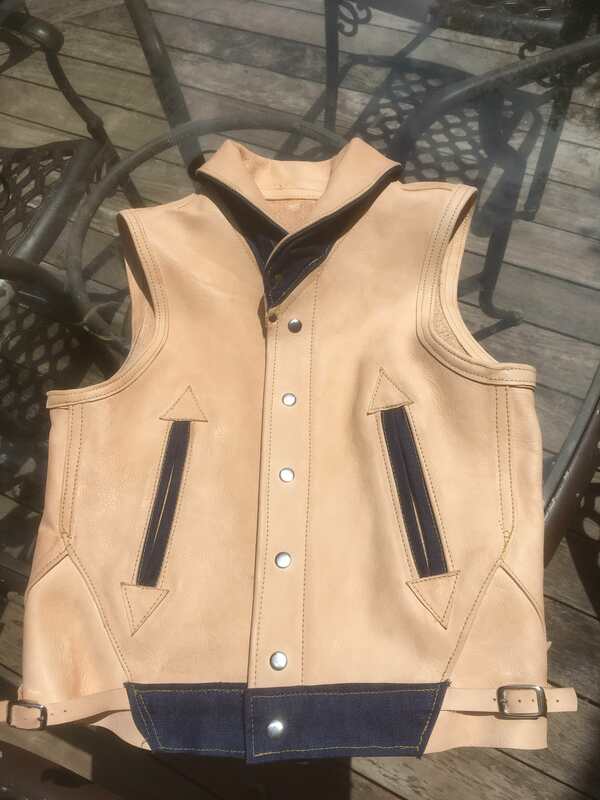 Very nice pieces both of them and let's see the back of that vest when you get a chance. It deserves it's own thread, for sure. You Made it! Your note on zipper-less pockets mirrors my own thoughts to a point. Here's my take: I never use hand-warmer pockets. In Iowa, with the cold we get, I'm into gloves and all by the time I would want to use the hand-warmer pockets. I know this will be controversial, but that's one of the few things I dislike about my 1980 vintage Vanson Enifeld, it has the "drooping" pockets as there are no zippers. I know it's just personal preference, but I prefer the zippers, I also prefer zipped sleeves (much easier for wearing a backpack then the button-cuff Aero offers) and simply the slightly more "metallic" look in either brass or nickel. Go with with You like! And deep congratulations on buying a life-time jacket so early in your life.